To the shock (and perhaps horror) of my friends and family, my wedding dress was not my main concern when I started the planning process. I was much more concerned with finding a wonderful photographer and the perfect reception venue than I was about the fabric, style or colour of my potential dress. Now, with almost 6 months until the big day, the dress is something I have had to give some serious thought to. It started with the generous gift by a family friend of the ‘basic’ dress I wanted. I then found an image of what I wanted it to become, and started the search for dressmaker (to alter it) and fabric. 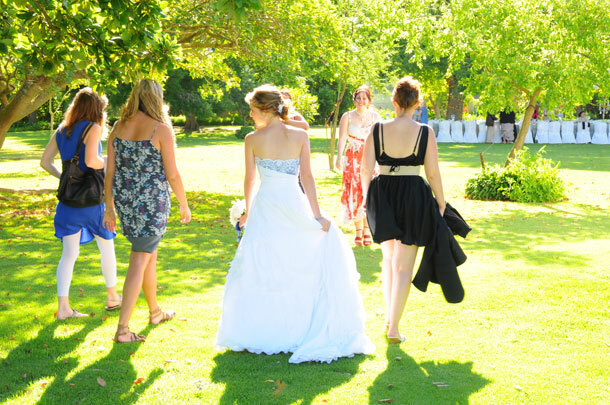 After looking at buying or hiring dresses, I thought this route would be more cost effective and generally suit me better – after seeing dresses to buy from R10 000, and to hire from R2000, I was hopeful. Ahem. That was until I saw the price of lace – of which I needed around 3 meters. Going lace shopping with my mom, the first roll I picked up was R1100. Per meter. I then looked at a more subdued roll, plain and simple – for R2000 a meter. Apparently it’s called ‘Chantilly’ and is imported from Paris. Of course. I eventually found my perfect lace – the colour, design, embellishment and price, just for me. Thankfully, it still worked out cheaper than hiring would have been, and after seeing and holding the fabric, I am more attached and invested in my dream of a dress than I ever thought I would be. Admittedly this is not everyone’s style, but a mid-calf or even knee length white / off white dress will be significantly cheaper than a floor length gown. To help you along, 50’s style prom dresses are making a big comeback in the 2012 / 2013 wedding season. Blue, pink, green, bronze…these are all options to consider. A great option if you’d like to wear your dress again for other functions (if the groom can do it with his tux, why can’t you do it with your dress?) and as they will be available at non-traditional bridal shops, they will be at least half the price. Candice’s Bridal Diary: Getting Pretty!